March on the Pentagon: Find a bus in your area! DO SOMETHINGSTOP THIS STINKING WAR! SATURDAY, MARCH 17 is the MARCH ON THE PENTAGON in WASHINGTON, DC. Get Up, Stand up and March for peace & sanity. For those who cannot attend, or for those who cannot attend a local event to reflect on the DC march, there’s no saying you cannot represent your opposition to this filthy, immoral war with your flags and banners, shirts and symbols waving throughout the days ahead, and especially on March 17th. A meet-up list covering all states is at bottom of this story, organized by state. 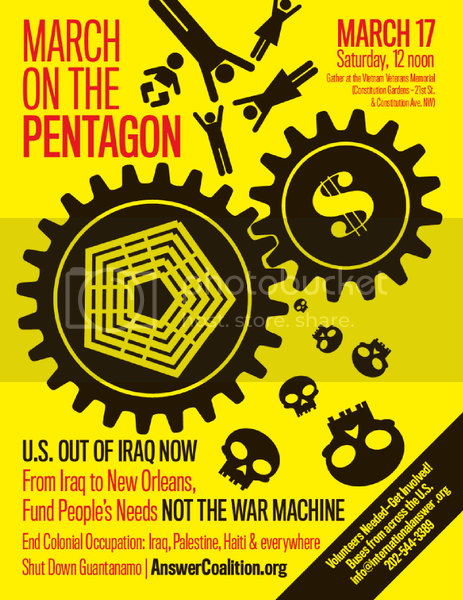 This March on the Pentagon may get press – it may not – but it most certainly will gain Awareness, whether the press has the cajones to report, or not. 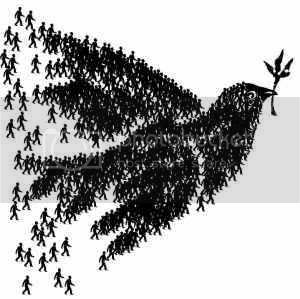 Request peace songs on the radio, while making a blurb about March 17, peace rallies, etc. In other words, Make Some Noise.